A few Mays ago my friend and fellow expat, Emily and I struck up a flirty conversation with two handsome Italians at a party. Flirting with foreigners is actually quite easy as endless quirky cultural differences are sure to keep the witty banter alive (if you haven’t tried it, do). Our cultural difference that evening happened to be the concept of exercise for females. Our two ragazzi told us that Italian girls wouldn’t dream of breaking a sweat. They stay skinny by simply not eating. In all fairness I never actually got an Italian woman’s opinion on the subject. But Emily and I found the concept fascinating as eating is one of our favorite pass times. So we explained to the boys that we work out to offset our unhealthy eating habits. Fate esercizi??? They were shocked. SHOCKED. A couple of days later we received an invite from the two ragazzi to go for a friendly group jog at the Cascine (a park just west of town). Was this a double date? Were we on the cusp of Italian boyfriends? Were dual citizenship and bi-lingual babies in our future? As our naive minds raced we quickly accepted the invitation – only later to realize the error of our ways . While back in the States we were practically Working-Out Barbies, our exercise circuit in Italy consisted of night strolls to Cafè San Marco for bomboloni. Sure we had attempted jogging a couple of times, but running through the crowded cobblestone streets of the city center proved both embarrassing and hazardous (ask me about the scars on my knees). We had to get in shape and fast. But how? Luckily, our last cobblestone stumble landed us on one of my favorite little pieces of Florence – the Arno trail. A path runs along both the north and south sides of the Arno. In the thick of the city the path turns into a sidewalk that only half of my body even fits on. But don’t let that deter you. Outside of the hustle and bustle, the path will take you away from the center to picturesque views, parks, foliage (a rare sight in the city), food stands and even some ping pong tables! Ok, I know, it was a long lead in, but we owe those two unnamed Italiani for our little discovery. At first, the trail served as my quick fix to get in shape. There were no loitering pedestrians in my way, no swerving bikes or speeding Fiats, and I even found conveniently placed water pumps along the trail for re-hydrating. Outside of my exercise routine, however, the trail became one of my favorite refuges for a diesel, and crowd-free jaunt. The path is clearly easy to find (just make your way to the river). To avoid crowds in the center however, I like to start where the east side of the Viale meets the Arno at the Torre della Zecca Vecchia. Walk to the water and head left (east). The street will turn into a sidewalk, sidewalk into path, and path into a perfect trail just for you and a few fellow Florentine lovers of fresh air. Italian bambini hang from swing sets. An elderly couple sits quietly holding hands on a bench, watching the rowing teams practice below. A few fishermen try their hands at catching dinner in the muddy river, and dogs frolic through the grass, a welcome change from the rocky cobblestone streets of the city. The further you go, the thinner the crowds will become and the more river you will have to yourself. And what will you be contemplating as you stroll along the river? Surely a little history! 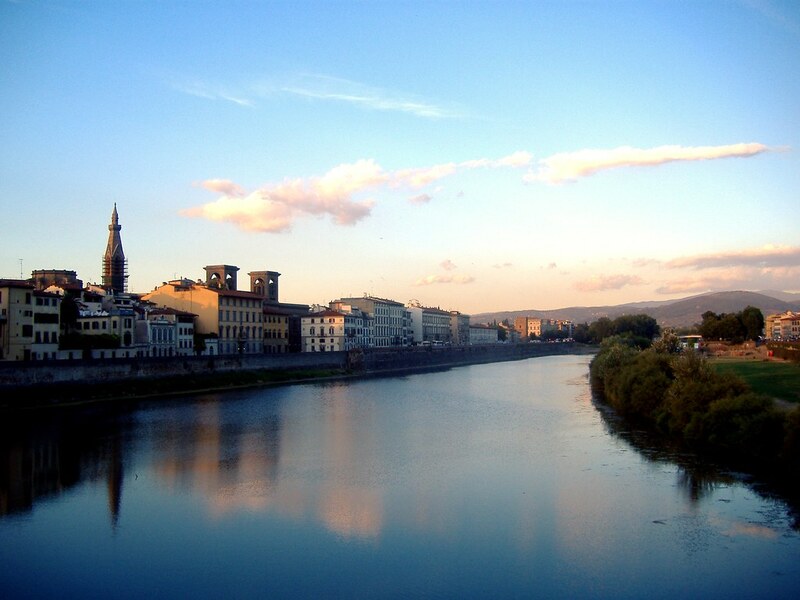 The Arno has and always will be, the best friend and worst enemy of Florence. We can’t villainize the river too quickly, as the Ancient Romans never would have settled at this point in Tuscany if it weren’t for this interstate access to the Mediterranean. On this river, Florentines shipped their leather, lace and laws all throughout Tuscany. They bathed on its banks and drank from the waves (if you’ve seen the Arno, that probably grosses you out). The Arno was so respected it was even personified as a river god. Part of the Florentine identity rested on his shoulders and depictions of the god can be found all throughout the city and beyond. 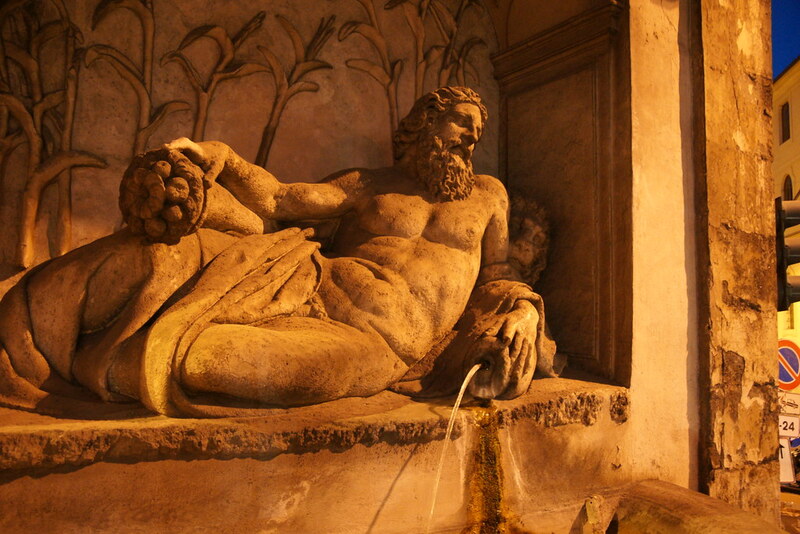 Such as this depiction of the River God Arno in Rome, an ode to Medici Pope, Leo X. Unfortunately, the Florentines’ love of their river turned out to be unrequited, as the Arno had no problem devastating the city numerous times throughout history. The most recent was the flood of 1966 that damaged countless works of art, churches, buildings, and even took several lives. When walking through the streets of Florence, occasionally look up, yes up, to find white markers that indicate water levels from the flood. So while we hated the Arno in 1966, today, as we look out over this view…..
…we love it all over again. 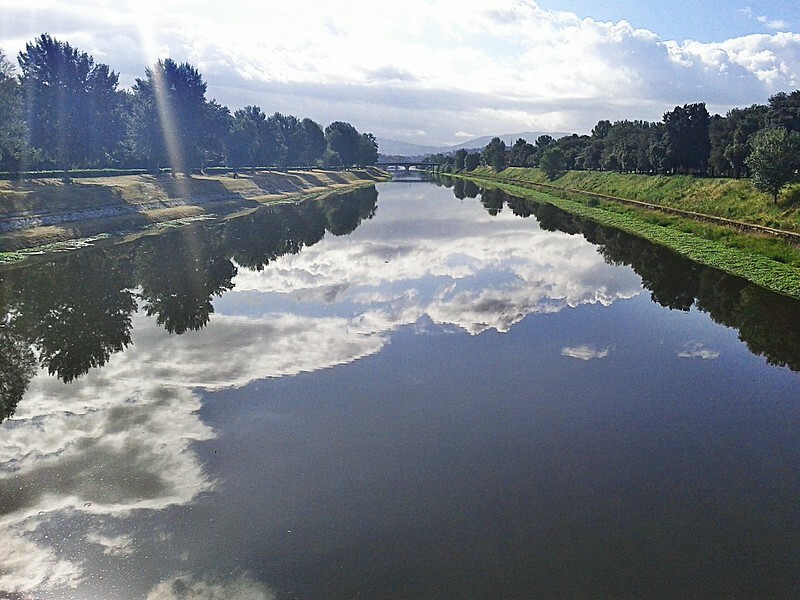 Whether you’re simply happy to find an uninterrupted trail to stretch your legs or need some alone time with your iPod and some fresh air, the Arno trail is waiting. And until Meg and I hit it big, only our close posse of FFF followers such as yourselves, even know that it’s there. Oh and if you were wondering…….no bilingual babies. Thanks for this story! My husband and I are avid runners and were wondering how/where we would be able to run or if we’d have to join a gym (not gym fans,ugh). I love your posts and thanks for doing them. We learn so much! Thanks Bev! I sometimes wonder if gyms even exist in Italy. I have friends who claim they do but I have yet to see one that is bigger than a peanut. So running out and about is the way to go. 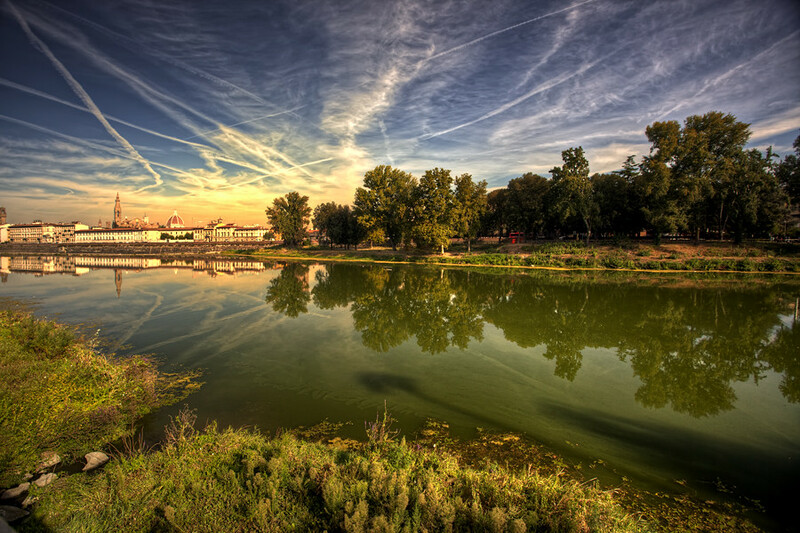 I would also recommend running out at the Cascine (big park along the Arno west of town) or checking out some of the trails in the hills around the city. Either way, getting out of town is your best bet! Each year at Thanksgiving, we visit Florence. My Hubby has many magical photos of the Arno – at daybreak, sunset, clouds overhead…it’s hard not to love it at any time of day. We’ll look forward to discovering the trail. Thanks so much! If you have a minute, take a look at his Earthvisions Photography website. The link is on our blog. He is just starting to “build” the # of images there, so it is being updated as he has time. I’m sure he would be delighted to have you use them, and mention his name. That would be super!